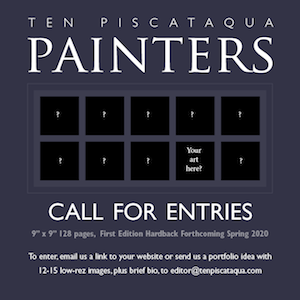 With the success of our first, we’re pleased to announce the second in our series of coffee table books: Ten Piscataqua Painters which is to be published Summer 2020. This time we’re reaching into the community with a CALL FOR ENTRIES! Our show will be up at Lane Memorial Library (link on photography page) in Hampton all of March, with a book signing event Thursday March 14th, 5-7pm. Come meet this terrific cast of outstanding regional photographers and get your copy of the coffee table book signed. First Edition hardbacks are available online in our shop for $60 (free shipping), or from our Amazon.com listing, or at the following retail locations which we are just now building out.